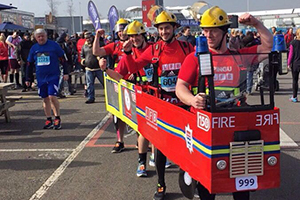 London Fire Brigade took part in the London Marathon this year and broke the world record for the ‘fastest marathon in a four-person costume’ – smashing the world record by nearly an hour! 47 members of the London Fire Brigade took part in the marathon this year raising thousands for charity. Congratulations to all that took part, fantastic effort! Click here if you want to donate to the London Fire Brigade for their amazing achievement.